Civil engineering is one of the very old and important branch of engineering and help in building great architecture design and deal in mainly in construction, and maintenance of those. In India PWD department mainly consist of Civil engineers which do mainly construction work like roads, bridges, canals, dams, and buildings. 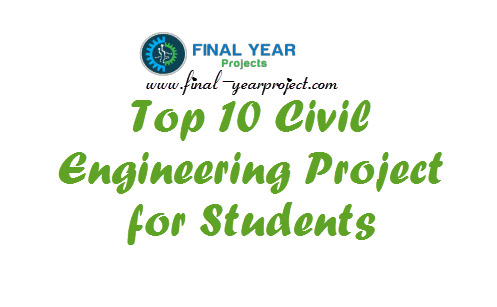 In this post we have selected 10 Civil engineering project for students which are free to download. You can also Subscribe to FINAL YEAR PROJECT'S by Email for more such projects and seminar. 12. Microscopic Modelling Of Pedestrian Dynamics. 13. Hydraulic Conductivity and Leachate Characteristics of Lime Stabilized Flyash. 14. Reliability Based Seismic Design of Open Ground Storey Framed Buildings. 15. Bearing Capacity of Rectangular Footing Resting Over Geogrid Reinforced Sand Under Eccentric Loading. There are many other Civil engineering projects at our website which you can find in above link. 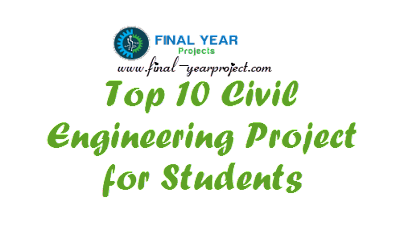 You can also submit your own final year Civil project and seminar to us through email given in contact page or can also suggest Civil project by commenting below. If you want to discuss about any Civil project topic, you can discuss that on our FYP forum. sir, i want to know the report on dam projects?? Will try to get more project on Dam for you. Can you provide me a project of arch design with report. Please check our Civil section. Design and estimate an institutional building project plz..
You can try below link.